Junior point guard Tiana Magankahia posted a triple-double for Syracuse yesterday. Photo courtesy of Syracuse Athletics. No. 1 Notre Dame. (16-1, 4-0 ACC) Muffet McGraw’s Fighting Irish are an obvious juggernaut this year. They’re loaded with blue-chip talent, and the only blemish on their record thus far is a 71-89 loss to UConn on Dec. 2. That game got away from them in the second half, but they recently proved more than capable of being on the other side of the coin, dropping an absolute hammer on No. 2 Louisville while pulling away for a 82-68 victory Thursday night. They also demolished Wake Forest 78-48 on Sunday. The Numbers (stat/national ranking): Offensive Rating 125.0/3rd, Defensive Rating 70.3/4th, PPG 88.6/3rd, FG percent 52.1/1st, 3FG percent 33.3/83rd, FT percent 73.8/63rd, EFG percent 55.1/6th, APG 19.8/6th, Assist/Turnover Ratio 1.36/10th, Off. Rebound Rate 41.9/11th, Def. Rebound Rate 68.2/137th, Total Rebound Rate 56.6/19th. Biggest Strength: A balanced scoring attack. Arike Ogunbowale’s 22.6 PPG has her on pace to comfortably pass Skyler Diggins’ all-time school scoring record, but the terrifying thing for opponents is that she’s one of five Irish players averaging double figures. Jackie Young (15.2), Jessica Shepard (14.8), Brianna Turner (13.1) and Marina Mabrey (12.6) are all playing lights-out basketball. Notre Dame bury their foes by ensuring that there are no less than three or four players on the floor capable of burning them on nearly every possession. Biggest Weakness: Three pointers. By design, McGraw’s offense does not heavily emphasize shots from behind the arc (they’re 325th nationally in three-point attempts), and they really haven’t needed to so far. Nonetheless, that 33.3 percent from deep is somewhat concerning. Ogunbowale has historically been capable of lighting it up, but she’s shooting a disappointing 30.9 percent from downtown this year. Mabrey (40.4 percent) is the only player on the roster currently both taking and making treys at a high clip. In the unlikely event Notre Dame find themselves in a hole and need to shoot their way back, that tiny flaw in an otherwise immaculate team could be a problem. No. 2 Louisville (15-1, 3-1 ACC) The Cardinals bounced back from Thursday’s loss to Notre Dame with a commanding 61-44 win over a very good Georgia Tech squad. While Jeff Walz’s team has looked inconsistent at times this year, they’ve also racked up plenty of good wins and have been downright unstoppable for long stretches. When they’re cooking, Louisville is as dangerous as any team in the country, and they have what should be two more W’s coming against Virginia and Wake Forest before meeting FSU on Jan. 24. The Numbers (stat/national ranking): Offensive Rating 117.7/6th, Defensive Rating 78.6/26th, PPG 82.8/9th, FG percent 48.5/8th, 3FG percent 36.8/30th, FT percent 75.3/33rd, EFG percent 54.5/11th, APG 16.8/33rd, Assist/Turnover Ratio 1.24/20th, Off. Rebound Rate 36.4/70th, Def. Rebound Rate 65.1/247th, Total Rebound Rate 51.6/113th. Biggest Strength: Asia Durr. Also shining are Arica Carter, Sam Fuehring, and Dana Evans, all of whom are averaging just over 10 PPG and playing very well this year. Louisville is calibrated to key off of Durr’s singular brilliance. Averaging 21.5 points and 3.6 in both rebounds and assists, she is the engine, the barometer, and the alpha that makes the team run. When she’s in full-on virtuoso form, the Cardinals can stand toe-to-toe with anyone. If she has an off night against good competition, they don’t have much of a Plan B. Fortunately for her team, Durr is almost never, ever, off. Biggest Weakness: Rebounding. The numbers up top say it all. Fuehring is the team’s leading rebounder at 6.1 boards a game, and that has to be a major concern. Top-echelon ranking aside, Louisville simply can’t compete in March if they can’t figure out a way to clean the glass more effectively. Durr can work miracles, but not if the team isn’t coming down with the ball to begin with. No. 8 NC State (17-0, 4-0 ACC) Wes Moore’s Wolfpack have proven themselves equal to every challenge so far. 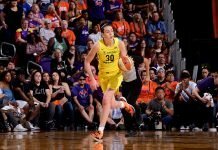 Division I’s lone remaining undefeated squad lost starting PG Kaila Ealey before the season began and guard Grace Hunter to an ACL tear last week. Despite the injuries, State’s patchwork back court hasn’t steered them wrong yet. Moore’s ability to reconfigure his roster on the fly has been something of a signature in Raleigh, and he has faced and surpassed expectations so far by relying on that talent. The Wolfpack are perfect on the season, but how long can they stay that way? The Numbers (stat/national ranking): Offensive Rating 113.9/13th, Defensive Rating 75.7/14th, PPG 75.6/37th, FG percent 46.9/16th, 3FG percent 35.0/58th, FT percent 69.4/163rd, EFG percent 53.7/15th, APG 17.2/26th, Assist/Turnover Ratio 1.19/25th, Off. Rebound Rate 37.3/52nd, Def. Rebound Rate 74.7/7th, Total Rebound Rate 58.1/5th. Biggest Strength: Completeness. NC State is so perfectly balanced across the board that it almost defies comprehension. They play smart, hard, and mostly very well in every aspect of the game. They’re not elite in any particular category, but they also have no readily-identifiable weaknesses. The breadth of their collective efforts has kept them perfect so far. A squad so adept on both ends of the court is a problem for anyone. Biggest Weakness: Completeness, but not dominance. The Pack are somewhere between good and very-good-to-great in every area, but they’re not truly elite in any one facet of the game. Ranking fifth in total rebound rate is their only top 5 statistical category. There is a strong possibility State will need to lean heavily on something in a critical moment or stretch or game going forward. If they can’t identify or trust in a particular bellwether when they need it, that might be a problem their versatility can’t overcome. No. 12 Syracuse (14-2, 3-0 ACC) Syracuse’s only two losses this season have been close affairs against ranked teams. 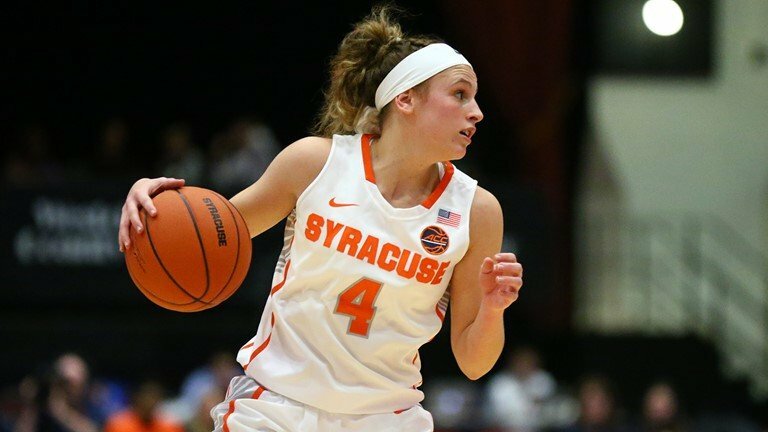 In their most recent contest, Tiana Mangakahia tossed up a 34-10-10 trip-dub as the Orange cruised past North Carolina for their 14th victory on Sunday. Syracuse is destroying opponents on the strength of a punishing defense and their star guard’s outstanding play. It’s taken the some of best in the nation to beat them largely because they’ve been so brilliant. The Numbers (stat/national ranking): Offensive Rating 110.3/23rd, Defensive Rating 73.8/7th, PPG 80.5/17th, FG percent 44.6/33rd, 3FG percent 33.0/97th, FT percent 75.3/32nd, EFG percent 51.9/28th, APG 18.4/14th, Assist/Turnover Ratio 1.01/68th, Off. Rebound Rate 36.5/68th, Def. Rebound Rate 68.8/122nd, Total Rebound Rate 53.6/52nd. Biggest Strength: Defense. The Orange is succeeding largely by smothering their opponents. Quentin Hillsman’s team is playing his preferred brand of defense, and the results are predictably excellent. As long as they continue pressuring smartly and aggressively, they will make it difficult for their competition to get in rhythm or score effectively. Biggest Weakness: Turnovers. At 18.3 per game (262nd nationally) and a 19.8 percent turnover rate (191st), Syracuse is coughing it up too often to for a team that otherwise plays at an elite level. They’ll need to take better care of the ball if they want to make a deep run in March. No. 22 Florida State (14-2, 2-1 ACC) Despite dropping a 45-57 loss to Clemson on Sunday, Sue Semrau’s Seminoles have been playing exemplary basketball this season, and they continue to show signs of a potential ACC spoiler at worst and a legit Cinderella at best. Their loss was evidence of their floor performance level, but FSU’s ceiling is still high. The Numbers (stat/national ranking): Offensive Rating 105.7/45th, Defensive Rating 78.8/29th, PPG 70.8/79th, FG percent 42.4/88th, 3FG percent 30.2/202nd, FT percent 73.7/64th, EFG percent 47.5/94th, APG 13.9/121st, Assist/Turnover Ratio 1.02/64th, Off. Rebound Rate 39.0/31st, Def. Rebound Rate 71.9/50th, Total Rebound Rate 55.4/28th. Biggest Strength: Offensive rebounding. Trailing only Boston College, Georgia Tech and Notre Dame in conference offensive rebounding rate, the Seminoles are doing a good job cleaning the glass and outworking opponents on the more difficult end of the rebounding spectrum. Biggest Weakness: Shooting. With 42.4/30.2/73.7 splits with 47.5 EFG, FSU is not shooting like a top 25 team. It’s tough to argue with their win-loss record obviously, but outside of Kiah Gillespie (51.6), no Seminole logging significant playing time is carrying a field goal percentage better than Valencia Myers’ 45.4. They’ve been scoring and winning enough that it hasn’t mattered, but their shooting efficiency needs to improve significantly if they want to pursue bigger aspirations.